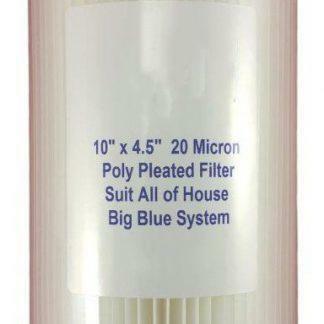 10″ x 4.5″ 100 Micron Pleated RE-USABLE Sediment Filter. Type: Poly Pleated. Suits: Big Blue – All of House Applications. This is the much sought after 100 MICRON RE-USABLE Sediment FIlter.Suitable for Use: Bore Water with sandy grit and coarse sediment present, and where finer filtration is in use further downstream. Filters out leaves, heavy grit and dirt. 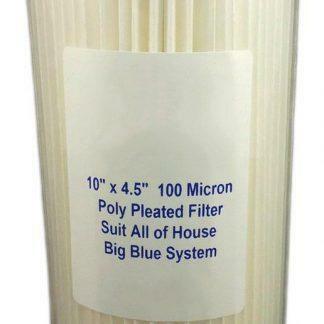 BB Pleated Thai Sediment 20micron 10" x 4.5" BB Poly Spun Sediment Filter 5micron 10" x 4.5"